After being denied a likely spot on the Paris-Nice podium by three crashes in the final stage - the last of which was capitalised on by the Movistar Team of eventual third place Alejandro Valverde - Omega Pharma-Quick Step’s Levi Leipheimer is now looking ahead to the next part of his season. Having sat out the Belgian team’s subsequent races, the American starts today’s Volta a Catalunya, which he will use to build form for his home race, the Amgen Tour of California, which is his biggest target of the first half of the season. Hitting the tarmac three times in one day may have cost him a result in the Race to the Sun however, but Leipheimer acknowledges that things could have been a whole lot worse. “I mean you know I am actually pretty lucky having crashed three times, hitting a motorbike,” he said in an interview on the team’s website. “I just have scrapes bruises and soreness, but it's all going away pretty quickly. While Leipheimer is not starting the WorldTour race with overall victory foremost in his mind, he will be keeping an open mind and will decide whether to try for the win if his form indicates that it’s possible. With Catalunya under his belt, Leipheimer will be building for the Tour of California, which starts in his home town of Santa Rosa on May 13th. As a three-time winner of the race, Leipheimer is looking forward to leading his new Omega Pharma-Quick Step team on US roads. “It's going to be exciting,” he said. “This whole year has been a fresh start, changing teams. It's been a long time since I've changed teams, which brings a lot of new motivation and perspective. Regarding Amgen Tour of California, it's an extra special year. It starts in my home town of Santa Rosa. I think that our community has been looking forward to this for a long time. I'm right there with them, looking forward to it. It's going to be exciting. So far in 2012 Omega Pharma-Quick Step has taken 19 victories on the road [as well as three in cyclocross and one on the track - ed], which is a marked improvement on 2011. This time last year, the team had just a stage of the Tour of Qatar from Tom Boonen, and Gert Steegmans’ Nokere Koerse victory to its name. The team has recruited a number of proven winners, including Leipheimer, World time trial champion Tony Martin, and the Slovakian Velits twins. Many of the team’s victories have been taken by its new riders, but a lot have come from the old guard, who are enjoying better fortune so far. “You know, it's special. 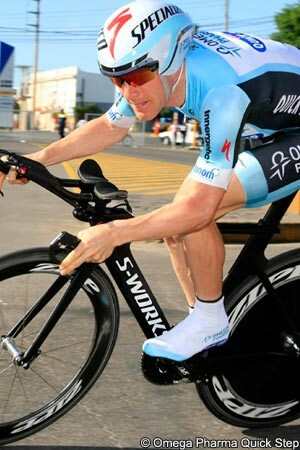 I've been doing this a while, doing this long enough to appreciate this success for what it is,” Leipheimer said. “It's not something you can really plan for. You do the training camps and training, but you don't say 'yeah, we're going to win 23 races by the middle of March.' This is something i've never seen. I think we just need to appreciate the fact we're having one of best starts of any team ever. If things don’t go our way, that's actually the norm. It's abnormal to win this many races. Although many of the team’s new riders are stage race winners and Grand Tour podium finishers, as a Belgian outfit the Omega Pharma-Quick Step team is still very much a Classics squad at its core. With many of the team’s Classics specialists following Boonen to the approaching cobbled races of the north, Leipheimer will be joined by a mixed team of climbers and rouleurs in Catalunya.